Many local fishing clubs are there to promote fishing, share local techniques and hotspots, participate in group outings, and more. Fisharc provides tools for these clubs to create their own group home page. 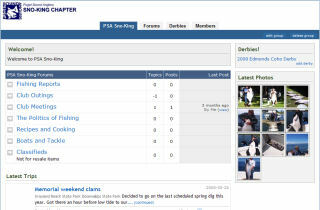 Groups can also create their own forums, and derbies with real-time leaderboard updates. Browse through our group list to see if there are any that you may want to join. If you run a club and would like to create a group, send us an email with your group's information to request one. We're contantly adding new group features. Currently, a group can create forums and derbies. You can assign group members to be admins, who can moderate forums and accept membership applications.